My father Cliff Utting was a milkman. 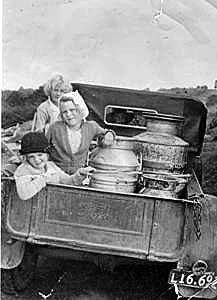 Supplying milk to people of Birkenhead was always part of my childhood. It was an exciting thrill when I was old enough to be allowed to get up in the early hours of the morning during school holidays to go and help on the milk run. Probably by the time I was old enough to be really useful, the novelty had worn off somewhat and I started to realise what a chore it was. However my father loved it and apart from the delivery of an essential product, it was quite a social occasion as we greeted customers and early risers on the way. We soon got to know people, not by name but by the amount of milk they got. It was 1 pint at no. 12, l½ at no. 14 and 3 at no. 16 etc. Bills went out each week and we had to either go or collect the money or it was left in the billy to be collected during the run. Originally it was our milk that was distributed and Dad used to go to other farms to pick up more milk to increase the amount. Then when bottled milk came we had to go to a depot in Barry's Point Rd. to pick up our quota. Bottles made life a lot easier for everyone but to drop one out of cold wet hands was to raise the ire of my father as we then had to stop and pick up every bit of glass, putting us behind schedule. The earliest milk supply I can remember was long before pasteurised milk came into being. Following the war years and my father's return, we shifted back onto the farm to pick up where we had left off a few years earlier when a manager ran things in Dad's absence. For the first few years we had a little dairy at the back door which housed the only refrigeration in the street and we used to keep all sorts of things for everyone in it. It was a deep chest with icy water in the bottom and held several large cans. Customers brought their containers and we would ladle out the required amount of milk using the appropriate measure. Then we got the lovely new dairy on the side of the road in front of the house (this later became "The little museum”). During my teenage years it was our job to "mind the dairy" every day. It was during this time that bottled milk came into being and of course it was all pasteurised. I clearly remember one elderly customer who absolutely refused to have "that pasteurised stuff" and would only accept" cow’s milk". So every day, we would empty bottles into a big billy, and ladle it out for her and she went away happy! Our delivery area was what is now Mahara Avenue, Colonial Road, Balmain Road, part of Mokoia Road, Rawene Road and Inkster Street. A highlight of this run was stopping off at the watchhouse at Kauri Point for a cup of cocoa. I felt very important doing that because it was behind a high barbed wire fence and someone had to come out to let us in. Very impressive stuff to a little girl! Another highlight was going into the Chelsea Sugar Works. There were several spots there where we dropped off milk and it was always overwhelming to me to see the size of those huge storage sheds where thousands of sacks of sugar were piled higher than I could ever imagine. Sometimes we were allowed to go into one part where we could scrape hard, sticky, toffee-like sugar off a machine and eat it. The best part though was that I was able to just watch adoringly those magnificent big draught horses that pulled the carts of sugar everywhere. What power they had and the noise of their shoes and their wonderful smell will always be one of my very special childhood memories. I loved those horses! I guess the funniest times at Chelsea were the sugar boats crewed by Chinese who just loved milk but couldn't speak English. To encounter people like that was very rare in those days and we never knew how much milk they wanted as they would arrive at the truck with all sorts of containers and would drink it down on the spot. The advent of bottled milk made things much easier. One thing I look back on with wonder was something that I doubt my mother ever knew about. The first houses in Rawene Rd. were on a lower level to the road which made it quite inconvenient to have to double back to the truck. So if the truck was put into first gear with handbrake sort of half on, it would gently roll down the road at the same speed as Dad who met up with it again when footpath and road rejoined at the same level. My worst memories of delivering milk during the late 1940s were of the customers who in the middle of winter would leave a threepenny bit in the bottom of a billy or jug that had still got water in it. Have you ever tried to pick up a tiny, coin with frozen fingers when it insisted on remaining stuck to the bottom of a wet container? The best part of it all were the special treats left out for us at Christmas by caring, grateful customers. It was so exciting to get them and know that the task of leaving milk on verandahs, back steps or other sometimes obscure spots, was really appreciated by some. At at least one house a quarter of a pint always had to be delivered straight into a cat's dish. It was all part of a service willingly given but very definitely now, belonging to a bygone era.